$50.00 gift voucher (certificate) from Texas Knifemaker's Supply. Expiration date is one year from date of purchase. If you are ordering only a gift voucher and want us to mail it to you, there is no shipping charge. Use the code, GIFTSHIP, when asked and the shipping charge will be credited to your shopping cart. 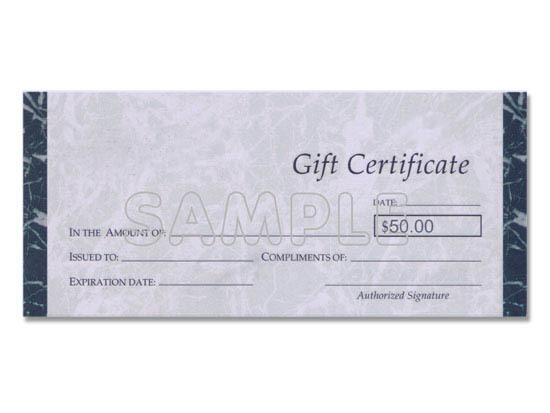 If you would like us to mail the voucher to the recipient, please put the name of the person you would like to give the gift voucher (certificate) to and the name of the person you would like the gift voucher (certificate) to be from. Use the comment section of the on-line order form to give us this information. If you would like to e-mail the Gift Voucher (certificate), then the on-line order form will direct you back to the Home page and you can go to My Customer Information on the right side of the screen and choose Send Gift Voucher. Guard - Brass Oval 4" x 1" 3/16"